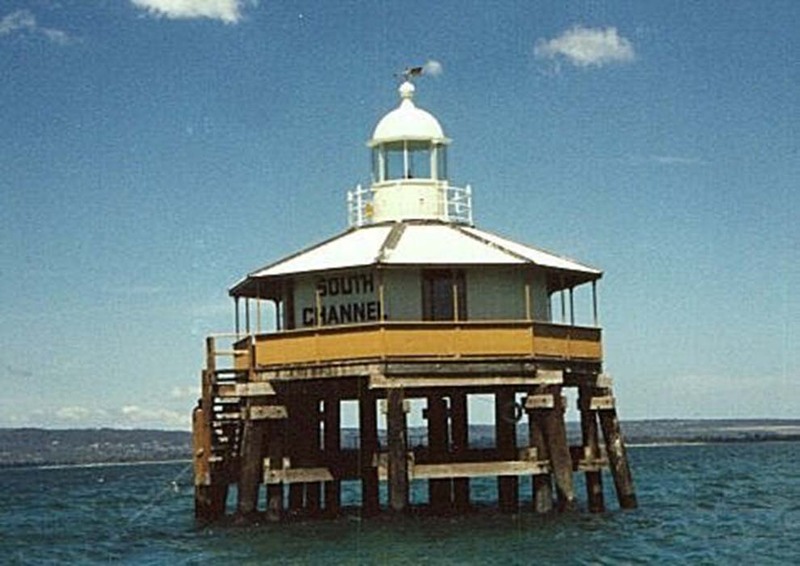 South Channel Pile Light | Lighthouses of Australia Inc.
After 125 years, the South Channel Pile Light has been restored and relocated to a safer location to assure its preservation as a piece of our maritime history. This remnant of 19th century channel markers that lead Melbourne bound ships through the South Channel was established in 1874. It was the front light, with the Eastern Light at McCrae the rear light. 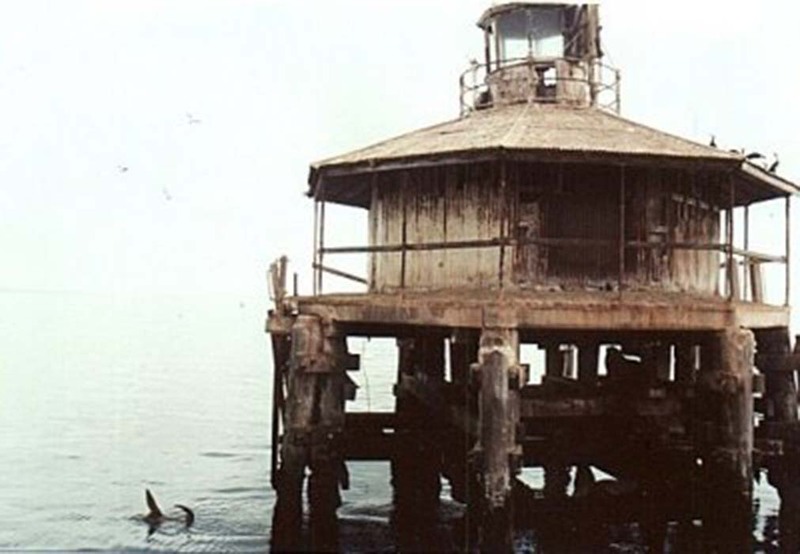 It is a single story octagonal structure, about 9 metres across and standing on timber piles in the water. The structure is the only one of its kind still intact in Australia. The structure included a living room with a fireplace and chimney, a bedroom with 4 bunks and an inspector’s office, which was also used as a store room. All this in a space only six metres in diameter. A hole in the floor served as a toilet. Rainwater was collected from the roof and stored in tanks. 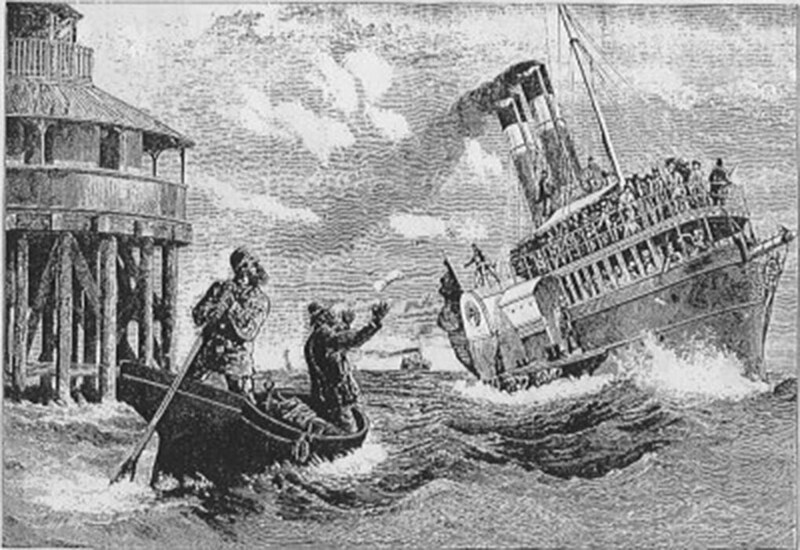 Keepers would wait for a passenger ferry to pass each morning to receive the newspaper, which was tossed to them from the deck. The light powered by a kerosene lantern that had to be kept alight by the keepers until the introduction of bottled acetylene gas in 1925. The light operated for 111 years until 1985 when it was turned off for a trial period. It was never turned back on. The structure quickly deteriorated due to lack of maintenance and vandalism. The wood was rotting, the steel was rusting and the piles were becoming unsound. The light was overrun with birds nesting inside and out. In 1998, Parks Victoria, who was then responsible for the historic pile light, lifted the light structure off its original piles. It was transported to Melbourne where it was faithfully restored then returned to a new location on new piles adjacent to the Rye Channel and three kilometres away from its original location. There is no operating light in the restored structure, although it is still used as a day mark by small boats. Between 1905 and 1913 the lighthouse keeper painted murals of sailing ships on the interior walls of the house. These were removed in 1979 and are now on display in the Polly Woodside Melbourne Maritime Museum.